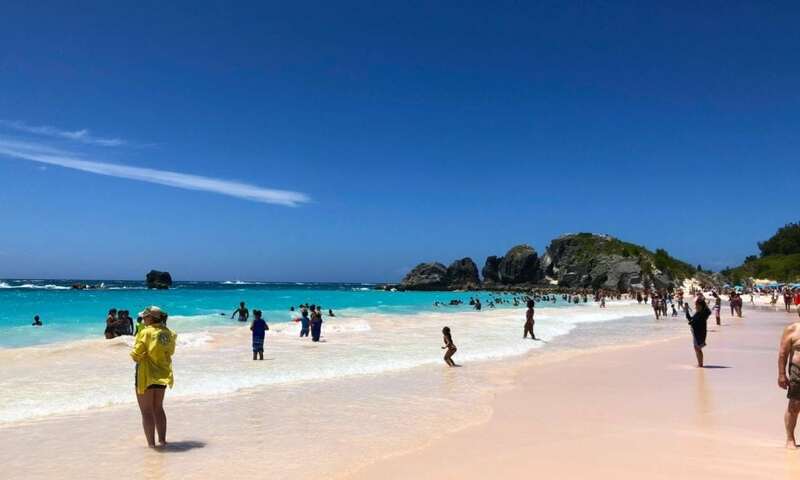 Until recently, I’d never been to Horseshoe Bay Beach in Bermuda, or to Bermuda at all, actually. To be fair, I’ve been reading about it for years and I’ve had all kinds of people – including more than a few readers and listeners – tell me it was the kind of place you have to see to believe. But somehow, I never got around to taking a trip there. During a short cruise that stopped in Bermuda for a day, I had a chance to visit the much-discussed beach, which is located on the southern coast of the island. About five minutes after arriving at the beach – having traveled there from King’s Wharf in the Royal Navy Dockyard by a shuttle bus – I figured out why TripAdvisor lists Horseshoe Bay as one of the top 10 beaches in the world. The shuttle buses lined up at King’s Wharf in Bermuda. It’s worth noting you can take the No. 7 public bus from the Dockyard to Horseshoe Bay for $4.50 per person. Even though this is by far the cheapest option, it can take twice as long to get there because the bus makes all the local stops along the way. On the plus side, unlike most cities, the public transportation is very organized, efficient, and clean in Bermuda. Insider Tip: The earlier you get off the ship – and the quicker you get to Horseshoe Bay – the better. Not only will you have more time, but there will be far fewer people. After a 25-minute scenic bus ride, you will arrive at Horseshoe Bay Beach. It’s a short walk down to the beach from where you’re dropped off. This is where you’ll have the chance to pick up anything you may have forgotten. Items at the beach shop are a lot more expensive than you will find back home (although probably comparable to what you might pay for some of it on the ship), so be sure to read the tips section at the end of this piece to avoid making any costly mistakes. For instance, I bought a mask and snorkel for $30. I could have easily ordered it on Amazon for half the price. You know when you’re looking at a postcard or a photo online and you think wow, this is unbelievable? That’s exactly what you’ll say when you set onto Horseshoe Bay Beach. Just off the pathway, past the stores and bars, you’ll be led onto the beach. To the left will be giant rocks with caves, to the right the shoreline. The water was warm, blue, and crystal clear, the sun was shining, and the day couldn’t have been more perfect. I noticed that there seemed to be a cluster of people swimming a little ways down the beach, so I wandered down to check it out. About 100 yards off the beach is a small series of reefs which create an amazing snorkeling spot. I put on my mask immediately began spotting parrot fish and angelfish and others that I can’t name. The reef and the corals were a playground for the fish, who didn’t seem at all bothered by us. Guess they’re just used to humans at this point. Just down the beach are several large rock formations as well as a few caves perfect for exploring. There was a time when visitors would climb to the top of these jagged outcroppings and take pretty amazing pictures of the beach, but I’m going to guess that some of them fell — and you could do some pretty serious damage to yourself here — because there were big ‘Keep Off The Rocks” signs posted. At the base of the rocks, there are a lot of tidal pools that are fun to explore, but be careful… some of them are pretty deep, and the drop-off can catch you off guard. Definitely watch your step. At one point, I set my sights on the sandy beach itself to see what the pink sands of Bermuda was all about. While the sand at Horseshoe Bay certainly has hints of pink, you have to examine it pretty closely to find actual granulated bits of pink. According to some of the locals I spoke to, the pink “sand” comes from tiny organisms which grow beneath the coral. Once they die, they are buried at the bottom of the ocean until tides and/or waves eventually wash them up onto the shore. Anyway, the sand here isn’t terribly pink, but it is incredibly beautiful. Insider Tip: Want to get away from the crowds? Take a walk away from the main part of the beach. You’ll find a great stretch that’s virtually empty. Just like on the private islands owned by the cruise lines, people tend to stop walking the second they hit the beach, planting themselves there. But if you break away from the pack, you’ll almost always find beautiful, secluded places. As you step onto the beach, you will notice a hut over to your left side with chairs stacked high, just waiting to be rented. They also have umbrellas, snorkel gear, and boogie boards available to rent for the afternoon. Want to go all-out (and avoid the hot sun)? You can rent a pop-up tent here as well. When you rent an umbrella, one of the shop attendants will bring it to the beach and get you set up. The same is true of beach chairs. So how much does it cost to rent the equipment? Bring sunscreen, towels, and your essential beach gear. It’s far cheaper to bring your own than it will be if you have to pick it up after you arrive. Apply sunscreen before you get to the beach. The sun can be pretty brutal, and a lot of people walk away with bad sunburns. If you plan on playing around the rocks, consider packing a pair of water shoes so you don’t tear your feet up. Get to the beach early (especially if there’s more than one ship in port) and head back to the ship a few hours before the end of the day so you don’t wind up tired, hungry, and having to wait in a long line to board. Even though the shops at Horseshoe Bay take credit cards, the shuttle drivers only take cash. The ride to the beach is only 20-25 minutes, but give yourself extra time when heading back to the ships just in case. You know what they say: Expect the unexpected. Bermuda is known for their Rum Swizzle — made with rum, fruit juices, grenadine, and bitters — so make sure to try one before leaving the island. As I mentioned before, I’d never been to Bermuda before, and this trip to Horseshoe Bay left me wishing that I had more time to explore the beautiful island. I’m already trying to figure out when I can jump on a cruise that docks here for a few days (as opposed to this particular itinerary, which only put us on the island for the afternoon). Have your own tips regarding Horseshoe Bay? Leave them in the comments.